Thanks to technology, even taking a shower has become more exciting, courtesy of the new trend of using the best LED shower heads. These types of showerheads add pomp and color to the shower cubicle. 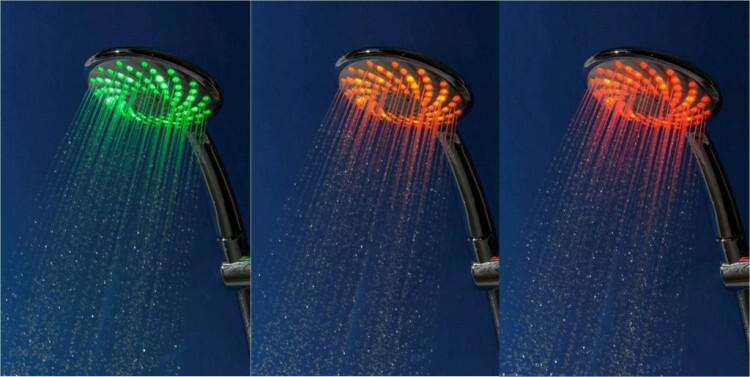 These showerheads light up the water in to an array of colors. The colors light up depending on the temperature of the water. In most cases, the water produces a blue glow signifying cold temperatures, while a red glow signifies hot temperatures. This is the primary importance of using LED showerhead as an alternative to basic models without lighting. These fixtures are safer to use than their conventional counterparts. Shower heads with light-emitting diodes may seem peculiar or strange but they are actually very much similar to other types of showerheads. The only difference is in how they function. Such fixtures are equipped with turbines that turn on automatically each time the water flows through the showerhead. This, in its turn, powers up the lights. It is the Light Emitting Diodes that light red or blue depending on the temperature of the water. Micro-controllers installed inside the fixtures detect the water temperature and produce the colors based on how hot or cold the water is. It is important to note that not all models adhere to the red and blue color combination. Additionally, not all models have temperature sensors. Thus, when purchasing your LED showerhead, it is important to check the color combinations of the shower head. Some models will have a rainbow of colors indicating different temperatures of the bathing water. Some will have additional colors such as green indicating warm temperature and flashing red indicating dangerously hot water temperature. Fixtures with no temperature sensors just cycle through all the rainbow colors producing a disco atmosphere in the bathroom and creating a special mood. Showerheads with light-emitting diodes are somewhat noisier than ordinary models due to the water passing through the turbines. Depending on the quality of the showerhead, the noise may be ordinary or a louder whine. While most LED-equipped models are turbine powered, there are also battery-powered models. When purchasing a LED showerhead, many people opt for the turbine powered ones as they dispense without the inconvenience of having to change batteries. However, turbine powered shower heads have a disadvantage—they produce more noise than shower heads that work on batteries. They are fun. They cycle through the colors of the rainbow and create a disco-like ambiance, which makes showering more fun and exciting. 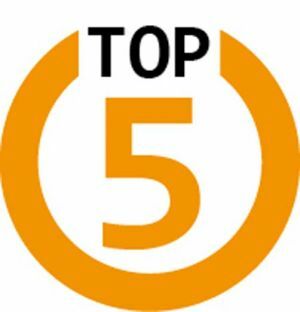 They also offer you some advantages of chromatherapy. They are safe. Most models come with temperature sensors indicating the temperature of the water flowing through. Depending on the light produced, you can define the temperature of the water without having to touch the showerhead or test the water. They help to save money. The light produced by LED showerheads makes bathroom lights unnecessary, considerably reducing the amount of money you pay for electricity. Thus these fixtures save on energy expenses. They can help create a romantic atmosphere. The array of colors produced by LED shower heads can be great for setting the perfect mood for that special person in your life. 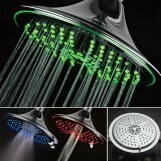 The Dream Spa All Chrome is said to be the most advanced LED showerhead. This model has four different water temperature color settings—blue, green, red and flashing red—and five settings, which include power rain, pulsating massage, hydro-mist, economy rain and water saving pause. The showerhead has a large 5.25-inch faceplate. The diodes are water-powered and can offer a flawless performance for up to 100,000 hours, which is the equivalent of 10 years of consistent daily use. This is according to the manufacturer. If this is true, then this brand can last a really long time without the need for replacement. Similar to the DreamSpa, the O-Flow is powered by water pressure and thus does not require batteries. The power generated by the turbines light up the lights producing twelve different colors, which fade continuously, creating a beautiful rainbow effect. The O-Flow has a great chrome finish and requires no plumbing work during installation. This showerhead easily attaches to any standard shower arm. The Ana Bath showerhead is a two in one showerhead that comes with a four-inch handheld shower supporting five watter supply modes. This handheld showerhead comes with five different settings, including saturating spray, massage spray, bubbling spray, saturating spray & massage spray, saturating spray & bubbling. The handheld shower has a 60-inch shower hose and a three-way diverter mount that is patented in the US and UK. The showerhead comes with a chrome finish and can be easily attached to any standard shower arm. The showerhead comes with a three-year warranty. The VDOMUS is one of the highest quality LED showerheads available on the market. This model has three water temperature color settings—blue, pink and red. Blue indicates cool temperatures between 0 degrees Celsius and 25 degrees Celsius, pink indicates temperatures between 25 degrees Celsius and 35 degrees Celsius, and red indicates temperatures between 36 degrees Celsius and 45 degrees Celsius. Its twelve light emitters are powered by water pressure running through the turbines. The faucets of this showerhead are made from durable copper with anti-corrosion and anti-abrasion properties. The faucets also have 10 micrometers of electroplating, which the manufacturer claims to have passed 96 hours of the neutral salt test. Manufactured by Interlink International, the Dreamspa Ultra Luxury is powered by running water and can be attached to any standard shower arm. This fixture comes with three water temperature sensor color settings and five power settings. The high-power settings are power rain, pulsating massage, water-saving pause, economy rain and hydro-mist. The showerhead is made up of a large eight-inch chrome-plated face with a reflective rim. In regards to water temperature sensors, blue indicates cool temperatures of below 950 F, green indicates warm temperatures of between 950 F and 1090 F, and red indicates hot temperatures of between 1090 F and 1220 F, while flashing red indicates dangerously hot temperatures of above 1220 F.
I’ve had the same problem. There is many caehicmls you can use but by accident I found the orange hand cleaner that mechanics use to wash off grease from their hands works great! Squeeze a glob onto a wet washcloth and wipe it on the glass. Waite for about fifteen or twenty minutes to let it soften the film and use a sponge sos pad. It wipes it right off and doesn’t scratch anything.